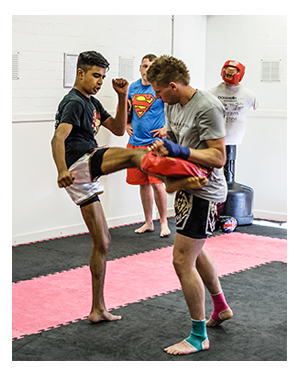 Training in Muay Thai is an excellent way to keep fit and healthy and at the same time learn practical self defence. Muay Thai is the ‘science of the eight limbs‘(Box, Elbow, Knee & Kick). You will learn correct boxing, elbow, knee and kick techniques as well as learn chokes, takedowns and stand up grappling known as clinch work. Muay Thai is a devastating martial art and the most exciting ring sport you will ever see & it offers a great total body workout. Wossobama Gym offers you exclusive learning via the Scottish Thai Boxing Associations syllabus, the only club locally to be approved by Scotland’s number one governing body. You can train for fitness, grades or to compete in competitions. If you’re starting off or unfit, perhaps overweight then don’t worry as we will guide you to success from day one. Beginners and all levels are welcome so come along or get in touch and step into the gym for a look – you’ll only really know what’s inside when you open the door. We offer training from complete beginner level to professional fighter’s level and we are part of a large network of camps that can offer competition training and fight matches should you chose to compete locally, nationally or across the globe. 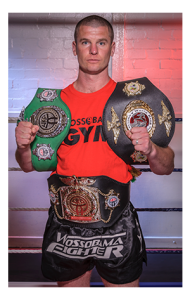 The Wossobama Fight Team has won more than 50 titles now at Scottish, British, K1, European and now world championship level. For example Ally Smith – Wossobama Fighter – is a double World Muay Thai title holder. Ally is our gym manager and takes lots of the Muay Thai sessions along with his trainer Alan Currie and wife Andrea alongside Paul Kelly another champion Thai Boxer.